Valuations are Elevated…What Should You Do? 23 JanValuations are Elevated…What Should You Do? When it comes to expected returns, valuation matters. In the stock market, paying less for something typically rewards you with higher returns (most of the time). Knowing this truth, what should investors do. Sit on the sidelines and wait for better prices. This is dangerous option…just ask anyone that opted to go this route over the last few years. 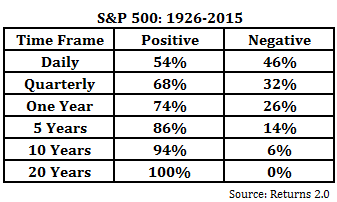 I’ll point to the table below that shows the percentage of outcomes over different time frames in the S&P 500. For longer term investors, I’d venture to say this option probably doesn’t make much sense. Close your eyes…buy and hold. Just looking at the table above, this seems like a better option for long term investors, but buying and holding is behavior that’s hard to stick to. To save readers time, I’ll just link to this post, BUY AND HOLD – THE BEST STRATEGY YOU CAN’T FOLLOW and move on to option #3. Use a simple trend following system to protect against the potential for large capital losses. We prefer a momentum based measure that’s simple to calculate, peak to trough drawdown. We wrote more about this here. While I certainly understand that valuations are elevated, I’d be the first to tell you that what goes up… usually goes up some more. When we sell any holding, our aim is to have the mindset of, “dang, I wish I’d sold X% ago” rather than “yep, this is the top” . This insures we make the most out of our wins (skewing the win:loss ratio) and keeps price in the driver seat, not our discretion. Price is what matters, not what we think, it will tell you when the party is over. Are prices elevated, sure. Can they go even higher, definitely. Are expected returns moving forward lower and risk for large capital losses higher; I can buy that argument. But, if elevated valuations have you worried, make sure that a decision today aimed to reduce risk is not actually increasing your risk tomorrow. As always we advocate rule-based and evidence supported behavior, and please remember that simple beats complex.